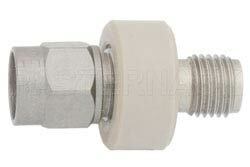 PE8223 is a coaxial RF DC block is from Pasternack and has an 50 Ohm impedance. Our 50 Ohm DC block is manufactured with a 2.92mm input and 2.92mm output. This 2.92mm DC block is an outer direct current block type. Pasternack outer 2.92mm DC block is rated for a minimum frequency of 10 MHz and a maximum frequency of 26.5 GHz. PE8223 2.92mm outer DC block has a maximum insertion loss of 0.5 dB and a maximum VSWR of 1.35:1. This outer 2.92mm RF direct current block is just one of over 40,000 components for RF, microwave and millimeter wave applications supplied by Pasternack. 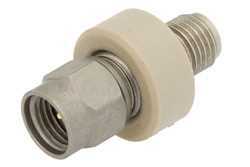 Our coaxial DC block with 2.92mm connectors is available to buy and be shipped globally the same day as with Pasternack's other RF parts in stock.